"Bag of money" redirects here. It is not to be confused with Bag Of Money (song). "Moneybags" redirects here. It is not to be confused with Moneybags (Spyro character). "Money purse" redirects here. It is not to be confused with prize money. "Shekel sack" redirects here. It is not to be confused with Shekel. A money bag (moneybag, bag of money, money sack, sack of money, bag of gold, gold bag, sack of gold, etc.) is a bag (normally with a drawstring) of money (or gold) used to hold and transport coins and banknotes from/to a mint, bank, ATM, vending machine, business, or other institution. Money bags are usually transported in an armored car or a money train and, in the past, via stagecoach. It is a type of Currency packaging. According to the account given in the Bible's Gospel of John, Judas Iscariot carried the disciples' money bag. Charon's obol, a death custom originating in ancient Greece whereby a coin is placed with a corpse, in the 3rd-4th century AD in Western Europe, were often found in pouches, making them money pouches. From the Middle Ages to around 1900, Rottweiler dogs were used by travelling butchers at markets to guard money pouches tied around their necks. Beginning in the 14th century, purses of money (panakizhi) were awarded to scholars during the Revathi Pattathanam, an annual assembly of scholars held in Kerala, India. In 16th century feudal Japan, samurai wore uchi-bukuro (money purses) around the waist or neck. In 1620, pediatric tracheotomy was unheard of until a boy tried to hide a bag of gold by swallowing it. It became lodged in his esophagus and blocked his trachea. The tracheotomy allowed the surgeon to manipulate the bag and it to pass through his system. In September 1864, Rose O'Neal Greenhow, a Confederate agent, drowned with a bag of gold around her neck after leaving the Condor (a British blockade runner ship) in a boat. A wealthy person can have the nickname "moneybag" (or "moneybags"). Marcus Licinius Crassus (c. 115-53 BC), a leading Roman politician in his day, was known in Rome as Dives, meaning "The Rich" or "Moneybags". Ivan I of Moscow ("Ivan the Moneybag") was a Russian Grand Duke of Moscow from 1328-1341 who was famous for being generous with his wealth. American Cardinal Francis Spellman (1889–1967) was sometimes called "Cardinal Moneybags" in his later life, while Chicago mobster and racketeer Murray Humphreys (1899–1965) was referred to as "Mr. Moneybags" by his friends. Miss Moneybags (played by Edna Purviance) is a fictional character in the 1915 Charlie Chaplin silent comedy film The Count. James Edward "Baron of Edgerton" Hanson's (1922–2004) billion-dollar empire earned him the nickname "Lord Moneybags". Another fictional character, Victor Newman (Eric Braeden) of The Young and the Restless soap opera, has also been called "Moneybags". 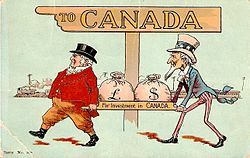 Postcard (postmarked 1907) depicting John Bull and Uncle Sam under sign "To Canada" bringing in sacks of money "for investment in Canada"
Money bags have been represented in art and culture throughout human history, including paintings, literature, film, television, games, and even food. A leno, a theatre of ancient Rome stock character (1st century BC to 5th century AD), is often depicted carrying a money bag. Jainism sculpture (c.10th-11th centuries AD) shows various Jain gods (Yaksa Sarvanubhuti) and/or their attendants/servants, holding money bags (chowrie, noli), purses (nakulika), or "purse-like objects" Buddhist (Pañcika and Vaiśravaṇa/Jambhala) and Hindu (Kubera) deities/gods/goddesses have money bags (or purses or their equivalent--"bag/sheath of jewels", etc.) as part of their iconography. Lugus, another god worshipped by Celtic people and identified with Mercury, the Roman god of commerce (Gaulish Mercury, in particular), is depicted carrying a money bag. Around 1130, Hugh of St. Victor's Chronica's preface refers to a money bag (sacculus or sacculum in Latin), with its compartments, as a memory training analogy. In the 16th century, The Conjurer, a painting by Hieronymus Bosch, features a child stealing a money purse from a bespectacled character. 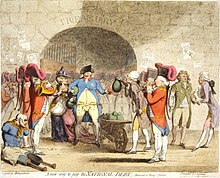 In A new way to pay the National Debt (1786), James Gillray caricatured King George III and Queen Charlotte awash with treasury funds to cover royal debts, with William Pitt handing him another moneybag. Around 1791, James Gillray published a cartoon about reaction to the Boydell Shakespeare Gallery labelled "Boydell sacrificing the Works of Shakespeare to the Devil of Money-Bags". The Apotheosis of Washington (1865), a fresco in the dome in the rotunda of the United States Capitol Building that contains a commerce scene with the Roman god Mercury holding a bag of gold. The obverse 1896 US Educational Series $2 bill shows an allegorical figure of Commerce who has a bag of money next to her, making it a picture of a bag of money on real money. In 1974, Herb Block produced Herblock Special Report, a book of political cartoons and text about Richard Nixon with some cartoons featuring money bags. In the South Park in episode "Two Days Before the Day After Tomorrow" (2005), a typically-antisemitic Cartman tries to stop Kyle at gunpoint, demanding the latter give up his bag of "Jew gold". It turns out that Kyle not only has a bag of gold (which he wears round his neck at all times), but a decoy bag as well. Dean Accessories makes a handbag from recycled decommissioned US mint money bags. 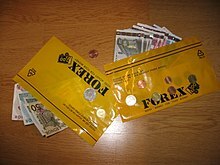 In various games, money bags (or bags of gold) tend to be used to represent treasure or points. In board games like Dungeon! (1975) a money bag is a treasure card, in Talisman (1983) as a card, and in Monopoly as a pawn/piece introduced in 1999. The 1976 television game show Break the Bank had a money bag as a space and The Price Is Right has a pricing game called "Balance Game". Video games such as Lock 'n' Chase (1981), Bagman (1982), Pitfall! (1982), Moneybags (1983), Bank Panic (1984), Circus Charlie (1984), Gunfright (1985), Roller Coaster (1985), Arm Wrestling (1985), the Castlevania series (1986-2010+), and Robin Hood: The Legend of Sherwood (2002) have money bags (or bags of gold) in them. As video game characters, Moneybags is a character in the Spyro the Dragon series and a boss named Moneybags in Dual Hearts. Wikimedia Commons has media related to Moneybags. 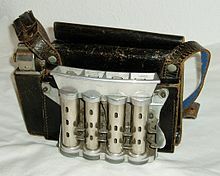 Look up money bag in Wiktionary, the free dictionary. This page was last edited on 14 April 2019, at 03:21 (UTC).